Colton is an ancient village; it was certainly here in Saxon times and was mentioned in the Domesday Book in 1086. It consisted of 3,642 acres a population of approx. 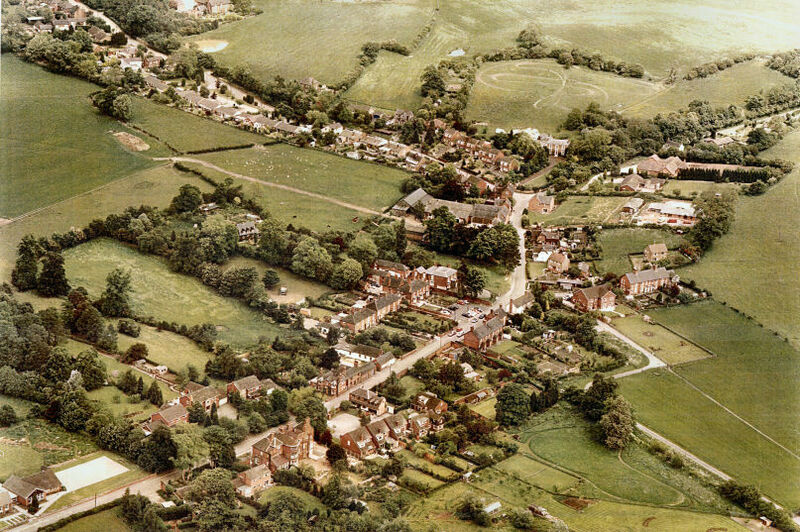 145 and at that time was the largest place between Stafford and Lichfield. In 1675 the population was approx. 300 and by 1901 the population had grown to approx. 677. There is a variety of soils in the area, so both arable and stock have been widely farmed. As time moved on so did the occupations of the inhabitants of Colton. With the coming of the canal, then the train more people found work outside the village. There have been many people of note living and associated with the village; in addition there are some wonderful buildings that can still be seen today. Nowadays although it would appear to be a small quiet sleepy village this is far from reality, with a recently refurbished village hall and a thriving community spirit. Colton is a small rural village of 800 inhabitants and 350 homes situated in Staffordshire on the edge of Cannock Chase on the B5013 Uttoxeter road. It is a very vibrant and active village involving both young and old. It has a village hall, parish church, primary school and two public houses. The Staffordshire Way passes through the main street of Colton and many tourists walk this route every year. The earliest evidence of habitation in the area is that of a skull found on Etchinghill, about two miles away dated to between 9,000 – 4,500 BC. While in Colton itself, burnt mounds that date back to the Iron Age (1500 – 43 BC) have been found. It is thought they were made by one of the tribes who built a huge fortification at Castle Ring on Cannock Chase some three miles away. The skeletons of woolly rhino, wolves and reindeer were also found about five miles away. In 43 BC – 407AD the Roman centre at Wall (Letocetum), a fortified outpost, near Lichfield, on the original Roman road to London was established. Wall, was a major junction at that time, roads crossing at that point go to Gloucester, Birmingham, Derby, Canterbury, York and London, on to the Wrekin and into Wales. At Rocester near Uttoxeter a military base was built and at least three defensive forts were in operation in order to maintain the peace, Colton is situated on the road between these two establishments. From 400 – 1066 AD the Anglo Saxons used the River Trent as a means of transport and gradually settled and then established themselves in the Staffordshire area. Our village is a model for this type of settlement being linear in appearance, with dwellings alongside the one main road. It was in about 650 AD that Staffordshire, or Mercia as it was then called, converted to Christianity. The earliest written recording of Colton is in the Domesday Book of 1086. Colton is recorded as having been held prior to the Norman invasion by four Saxon Thanes, Almund, Almaer, Oda and Wulfric. It is also one of only a small number of Staffordshire villages recorded as having a priest, which suggests that in Saxon times it was of significance. There was also a water mill on the Trent producing flour at that time. After the Norman Conquest the lands of Colton as well as most of Staffordshire were given to two knights as a reward for their services to William I in the invasion – Roger of Montgomery and Robert of Stafford. They then rented out their lands, which consisted of 1086 acres of which 300 acres were cultivated, 35 of meadow, two woods each approx 1 ½ miles x ¾ m and one mill on the Trent. There were 29 families and a priest working on the land and nine plough teams. The whole village was worth 90 shillings. Colton in the pre and post Conquest period must have been one of the largest settlements in the area because it received a Market Charter in 1246, some three years before neighbouring Rugeley. Throughout the middle ages it boasted a church, a market, burgage plots, three mills and a glassworks, evidence of all but the market can still be seen. The remains of the glasswork kilns within the Parish have been found in recent years and have been linked with the local glass working industry known to have been operating around Rugeley and Bagots Park in the middle ages. This local industry is known to have provided glass for such prestigious buildings as York Minster. In the early 17th Century, the Lord of the Manor, Walter Aston acted as Ambassador to Spain for James I and was created Baron Forfar for his services to the country. He occupied a substantial timber manor house in Colton and the boundaries of his ancient deer park can still be seen. The mid 17th Century saw a local Colton heiress, Constance Boughey marry Thomas Whitgreave of Moseley Old Hall. He was one of the Catholics who helped Charles II escape from the Battle of Worcester. By this marriage he became a significant landowner in Colton and the Whitgreave family remained so until the 20th Century. At the end of the 17th Century Herbert Aston achieved notoriety by being implicated along with Lord Stafford in the Popish Plot. It was reputed to have been partly plotted at his manor house in Colton, Bellamour Hall. The plot, although later to be proved fictitious, caused a huge outrage in England and both men along with other suspected plotters were imprisoned in the Tower. Lord Stafford was beheaded but the hoax was revealed before Herbert Aston lost his head and he was released. The 18th Century saw the building of the canal through Colton and in the 19th Century the building of the railway greatly encouraged by the Lord of the Manor in Colton, Mr. Horsfall who was MP for Liverpool. There are still a number of buildings in Colton today that are of historic value and make a walk through the village of interest. The parish church dates back to the 13th Century, parts of which can still be seen alongside the Victorian restoration that was carried out under the guidance of G. E. Street, a significant architect of the Victorian period. Some of his major work can be seen at the 7 ½ acre site that is The Royal Courts of Justice in London. Little Hay, the smallest of the manors recorded in Colton in the Domesday Book still has evidence of its Elizabethan predecessor in its grounds. It was owned and occupied by members of a significant Staffordshire family, the Bagots of neighbouring Blithfield Hall. The Bagots were a great influence in Colton alongside the Astons for a long period. Other houses of interest are Malt House Farm dating from the 16th Century; the remains of 17th Century Bellamour Hall as you enter the village; the original early 19th Century free school and also Boughey Hall Farm that can trace its history back to the 13th Century.